It is Christmas time, and as I sit to write this my house is still and quiet. My heart is filled with gratitude over the significance and beauty of this day that we celebrate. My gratitude to God for coming to us overwhelms me. Where would we be without the gift of God in the flesh? Each year, I ask for fresh revelation. I don’t ever want to be so familiar with scripture that I miss something new God wants to show me. There are always new things to notice, to ponder, to wrestle with, to be transformed by. Sometimes things I haven’t seen before rock my world and lead me to dig in to scripture for months. It is always fresh because the Holy Spirit makes it so. Pastor John’s sermon on Sunday gave me some things to ponder. The Peace candle is also called the Candle of the Angels–the angels who announced that God’s peace had arrived on earth in the form of a newborn baby. His Shalom–His answer for all that is wrong in the world, all that creates chaos, all that is broken, was embodied in this tiny homeless baby who had been laid in a livestock feed trough. In their greeting, Luke used the Hebrew word “Savior” the Greek word “Christ” and the blended word “Lord” which was understood by the Hebrew people as Adonai, their name for God, and the Roman world was quite familiar with the significance of the word Lord. Right there, in the declaration of the angels is the first public announcement that God is here on the earth, that He is here for everyone, and that His peace is available. Those on whom His favor rests are those who recognize Him and step into life under His Lordship. What those on whom HIs favor rests really means is those on whom His kindly intent rests, His kindness–the very thing that leads us to repent (Rom. 2:4)–available to all people everywhere. The shepherds are the ones who receive this message. The shepherds whose very profession causes them to be unclean. They are at the bottom of the religious hierarchy, unable to enter the temple themselves. They are outcasts, “less thans” — and, as often happens with those deemed “other” or “outsiders”, they have been stereotyped. They were stereotyped as dishonest people, so much so that they were not allowed to testify in court. Their testimony was always considered invalid. Yet, these very people, are the ones God chose to confirm that the angel’s message was true. I think there is much for us to ponder in God’s deliberate choices here. We must always be extremely careful with stereotypes. Those considered other, less than, and marginalized may be the very people that God is using to show us more of Himself and His Kingdom’s ways. In His Kingdom the last are the first, the least are the greatest, the humble are the lifted up, and His ministry of making things right–peace for all humankind–belongs to all of us who call Him Lord. We minister to Him when we love the hungry, the imprisoned, the poor, the naked, not as less than, but as Christ Himself. (Mt. 25). And I know from personal experience, He has much to teach us through the marginalized. So our first unlikely messengers, the shepherds, after they see Jesus, leave rejoicing and go tell everyone. Our second unlikely messengers, who actually declare Jesus as King, are the Magi. There are lots of assumptions made about the Magi–we most always see them in a group of three riding on camels, and they show up at the manger. Scripture doesn’t tell us that there were three, or what their names are, or that they rode on camels. What we do know is they came a long distance, they knew, when they saw his star, that the King of the Jews had been born, and they came to worship him. First important thing to note–these are not Jewish men. The Magi are Gentiles, considered pagans. What is God doing by including these outsiders? Not only are they Gentiles–they are mystics. The king summoned the enchanters, astrologers and diviners. Then he said to these wise men of Babylon, “Whoever reads this writing and tells me what it means will be clothed in purple and have a gold chain placed around his neck, and he will be made the third highest ruler in the kingdom.” Then all the king’s wise men came in, but they could not read the writing or tell the king what it meant. So King Belshazzar became even more terrified and his face grew more pale. His nobles were baffled. The queen, hearing the voices of the king and his nobles, came into the banquet hall. “May the king live forever!” she said. “Don’t be alarmed! Don’t look so pale! There is a man in your kingdom who has the spirit of the holy gods in him. In the time of your father he was found to have insight and intelligence and wisdom like that of the gods. Your father, King Nebuchadnezzar, appointed him chief of the magicians, enchanters, astrologers and diviners. He did this because Daniel, whom the king called Belteshazzar, was found to have a keen mind and knowledge and understanding, and also the ability to interpret dreams, explain riddles and solve difficult problems. Call for Daniel, and he will tell you what the writing means.” Daniel 5:7-12. Daniel was a Magi. Daniel was an undeterred, courageous, uncompromising lover and follower of the Most High God. Daniel counseled three kings in Babylon. He had great influence. Is it possible that the Magi that came to worship Jesus knew that the King of the Jews would be born because Daniel was a faithful witness to God’s promises and prophecies 600 years before? Matthew continues, in his account to let us know that the Magi went to King Herod to find out where the King of the Jews was to be born. Herod called in his priests and teachers of the law to find out, and Herod was greatly disturbed. Once the Magi learned that the prophecy spoke of Bethlehem, that’s where they went. The star led them to the right house. They were not the least bit concerned that Jesus wasn’t in a palace. They presented him with gifts, and they worshiped him. They were declaring that Jesus is King. God’s ways are not our ways. The religious community of Jesus’ day rejected him as King. He was a threat to their traditional way of doing things, and a threat to their power. The political community of the day certainly had no tolerance for a competing Kingdom. But God’s plans and ways will not be thwarted by our fallen world’s systems. He chooses foreigners, outsiders, oppressed people, mystics, and anyone else He cares to use, to draw us to Himself. Are we willing to let go of stereotypes? Are we willing to let the box we’ve put God in fall away, so that we can see Him, know Him, serve Him, love Him, and be instruments of His peace in this world that so desperately needs to experience His kindness and His love? My life, my love, my all. May this be the gift we offer to Jesus as we celebrate Him this season. I took the liberty of highlighting Luanne’s use of the word “all” above, because it so very important in our attempts to understand what the Shalom–the peace–of Jesus is all about. If Shalom is setting things right and bringing wholeness and restoration to ALL that is wrong and broken (and it is that…), then peace is only ever possible if ALL are included to the same degree. Where any are excluded, or where there is the absence of chaos but only through the means of hierarchy, there is not Shalom. Because in those instances, things are only really “right” and “whole” for some. The Prince of Peace came to rewrite our definition of peace. It was never meant to be exclusive. Do you know what is so mind blowing about all of this? All of these stories made it into our scriptures. They were written down by men who, according to the accepted practices of their time, could have completely dismissed their words. And what would we have if they had? When Shalom comes, this peace that includes and restores all things, it can feel like rejection and loss to those who have become accustomed to being the “elite”. We see this play out during the life of Jesus, too. How, as He elevated those who had lived under the feet of others–under the weight of power structures and systems that oppressed them– those who had the power and stood on top were very unwilling to be brought down to the foundation of equality Jesus was rebuilding (the foundation was first set in Eden–broken humanity destroyed it). His ways felt like loss to those who were on top. And it was loss–loss of all that was keeping them from the wholeness that is only possible Jesus’ way. It can be tempting to see this as a reminder that even when we feel less-than and unqualified to share our testimonies, we should share them anyway–and, maybe there are times we need to remember exactly that… But I would challenge all of us to take a good look at ourselves and our “place” in the world before we land in that place. Who around us is stereotyped? Whose testimony is deemed invalid in our time? Who are those seen as unclean in our culture? If the answer to those questions is not us, then we need to understand that we’re the ones who’ve become accustomed to being the “elite”. And we’re invited into the Shalom of Jesus. We are invited to come down to the level ground of Jesus to listen to those who He’s brought up to that same foundation. The foundation of the Prince of Peace–real, lasting, all-inclusive peace. Where all is made right, and all are made whole. Where all are invited to call Jesus our Life, our Lord, our King. On this foundation, the Kingdom of heaven comes. And the ways of this Kingdom are love and Shalom. Are we willing to give our lives, our love, our all to the King of this Kingdom? So if you’re serious about living this new resurrection life with Christ, act like it. Pursue the things over which Christ presides. Don’t shuffle along, eyes to the ground, absorbed with the things right in front of you. Look up, and be alert to what is going on around Christ—that’s where the action is. See things from his perspective. Your old life is dead. Your new life, which is your real life—even though invisible to spectators—is with Christ in God. He is your life. When Christ (your real life, remember) shows up again on this earth, you’ll show up, too—the real you, the glorious you. On the second Sunday of Advent, Pastor John lit the love candle. He invited us to consider how we are preparing for the coming of Christ, and whether or not it’s the love of Christ–or something else–that is magnified in our lives. During this season, as John pointed out, we do a lot of preparing. We spend time decorating, cooking, planning, wrapping–and we see Christmas morning as the culmination of all of our preparation. If you remember what we talked about last week, though, you know that we–as Jesus followers–aren’t only looking back at when he came in the past. We are looking with hope toward His coming again. That means our “preparation” need not be seasonal. It is, instead, a lifestyle. How does this verse fit with Christmas? The same way that it fits every day of the year. Which, if I’m not mistaken, was Pastor John’s point. We take time to celebrate and remember the first Advent of Christ at this time every year. But how we live, what we prioritize, where our focus is–these ought not change with the seasons. 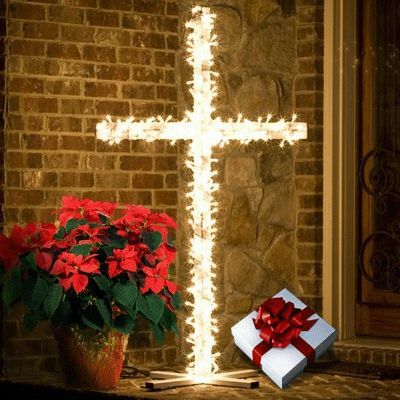 For Kingdom-minded Jesus followers, the “spirit of Christmas”–hope, love, joy, preparation, celebration, giving–is how we aim to live every day. How do we live this way? We set our minds on things above, not on earthly things. What it means is we have to find our focus. What, or who, is most important to you? What do you prioritize? What we focus on has our attention. Whatever has our attention becomes the object of our affection, our love.Whatever has our love is magnified in us. People know what we love because whatever we are focused on, we naturally magnify. So, to “set our minds” is to bring something into focus, to give our attention to something. The verse tells us to set our minds on things above, not on earthly things. I love the way the Message expresses this part: Don’t shuffle along, eyes to the ground, absorbed with the things right in front of you. Look up, and be alert to what is going on around Christ—that’s where the action is. See things from his perspective. “Things above” are the things of Christ. The things that matter to Him, to His kingdom. The earthly things aren’t all bad–many earthly things are good, and lovely. We’re just not supposed to set our minds on these things, give our affection to them, prioritize them. We are invited to look up from all the things of this world that can consume our hours and our days, and be alert to Christ. He is the One worthy of our affection, and His kingdom is the one we live from. But what do we do once we find our focus and set our minds on things above? Is that it? Focus on Christ and watch Him for the rest of our lives? John said on Sunday that “movement marks [God’s] whole story.” Every part of the story that includes Creation, life & death, our humanity, and God’s activity in it all moves. And perhaps no part of the story moves more than the pages where Jesus put skin on and came to us as one of us. What if Zechariah & Elizabeth, Mary, Joseph, the shepherds, and the wise men had simply watched…? Simply seen and heard…? It is possible to focus on Jesus, give Him our attention, and watch what He’s doing… all without moving from the place where we are. However, if He has all of our attention, and if that attention becomes affection that blossoms into love that outgrows our insides… it’s impossible to simply watch. When preparing our hearts and making space for our King becomes our one overwhelming desire, when we are wholly focused and wholly devoted to the One leading us, when we can say “Jesus, be the center of it all” and mean it with all that we are, we. will. move. Because love moves. Love sees what Jesus is doing and is stirred to join Him–no matter the cost. The individuals in our familiar Christmas stories had an awareness of God. But more than being aware of Him, they were devoted to Him. He was their priority. And so when He came to them, in whatever ways He chose, they accepted His invitation to join Him on the journey of a lifetime. A journey that would change not only their lives, but would change the entire world. Maybe we need to ask ourselves where we are this Advent season… Are we sitting in the stands, spectators who live with our heads down, focused on the things of earth? What if God wants to move part of His story through you? Through me? I have no doubt that we are invited to partner with Him as He changes this world. I have no doubt that He desires for all of us to join Him in what He’s doing right now. He loves to bring things above to bear through things below… More specifically, through people below. Sit with that verse for a minute. Let it have your attention–your focus. Ponder what it means. What we focus on has our attention. Whatever has our attention becomes the object of our affection, our love.Whatever has our love is magnified in us. People know what we love because whatever we are focused on, we naturally magnify. So, to “set our minds” is to bring something into focus, to give our attention to something. I also want to reiterate Laura’s point that to “set our minds” on something does not imply that we just sit and watch. To set our minds on something leads to the trajectory of our lives. Our actions begin in our minds, our words begin in our minds, our choices begin in our minds, our relationships thrive or not depending on how we think and what we choose as a result of those thoughts. In your relationships with one another, have the same mindset as Christ Jesus…(Ph 2:5). So, this week’s advent theme is love, yet it would appear that we are talking about something totally different–except for the fact that what we love consumes our minds, and agape (unconditional love) is a Holy Spirit empowered choice of the heart and mind followed by action. As I’ve pondered our key verse--set your minds (focus) on things above, I’ve wondered if “things above”– rather than referring to things far off, way up in some inaccessible place– could mean “things above” as in above our fallen world’s ways of doing things and our fallen world’s ways of thinking…setting our minds on the way God thinks–his mindset. God has said to us: As the heavens are higher than the earth, so are my ways higher than your ways and my thoughts than your thoughts. (Isaiah 55:9). I believe that to set our minds on things above means to align ourselves with God’s ways. In order to align ourselves with His ways, we must know Him, and to know Him we must love Him, and if we love Him, we will walk with Him, and He, and His ways, will consume our thoughts, and those thoughts will inform our choices, and our choices will lead us to live in Him, and His life in us will spill over to those around us, and He will be magnified. Acts 17:28 tells us that in Him we live and move and have our being. That verse certainly implies that Jesus is our total life force– it also implies action– movement. Pastor John, when talking to us about focusing on and magnifying something, explained to us the science behind magnification. In order for something to be magnified, light rays, which normally run parallel to one another, have to be bent, which happens when they pass through a curved lens. Those light rays then converge-are concentrated through the lens- and bring whatever is out of focus or hard to see into focus, making it possible to see detail that was previously unclear. In the Old Testament, when Moses asked God to show him His glory, God replied “You cannot see my face, for no one may see me and live.”(Ex. 33:20). The Christmas story includes beautiful accounts of magnification and light. Mary, in her song of praise (after Gabriel fills her in on God’s plan), exclaims my soul magnifies the Lord… (Luke 1:46). She rejoices that she is part of God’s plan and is willing to make Him great, to bring Him into focus, to carry His light, to yield to His plan, to magnify Him. In Luke 2 we are told that there were shepherds living out in the fields nearby, keeping watch over their flocks at night. An angel of the Lord appeared to them, and the glory of the Lord shone around them... Brilliant light caught their attention and resulted in them being among the first to see God in the flesh, to worship Him in person, and to carry the message of that encounter to those around them. In Matthew 2 we learn that the wise men, when looking for Jesus, told King Herod, “We have seen His star in the East and have come to worship Him.” Light led these men to leave their own country and travel a great distance in order to draw close to God who had come to make Himself known in the person of Jesus. There is acknowledgment, awe, and movement in each of these encounters. Jesus, in John 8:12 tells the people “I am the light of the world. Whoever follows me will never walk in darkness, but will have the light of life.” Whoever follows me… will have the light of life. To follow implies movement. To be the light of the world; to magnify the God who so loves the world that He gave His only Son; to bring God into focus, means choosing to bend before Him, to yield to His ways, so that His glorious light rays can shine through our lives, illuminating Him in a way that those around us can see Him and experience His love, His life, His light. Isaiah 9:6. What a beautiful scripture; one that is so familiar that we sometimes skim over it, but sitting with it for awhile, letting each “name”, each title, sink in with the full implications of what each one means takes us on a beautiful journey of hope. Hope that was needed in the days of Isaiah the prophet, and hope that is needed today. Do we even know how blessed we are to live in the period of time where the prophecy of the child has been fulfilled? Without a doubt, there is still much darkness in our world, much gloom. Many consult fortune tellers, mediums, spiritists, horoscopes, and the like as they try to find wisdom and direction for their lives. And the countless millions who, in the United States alone, believe conspiracy theories spread by media sources that lead to fear, dread, and suspicion is mind boggling. Many walk in darkness. Many are hopeless. Many are lost. And even some who know Jesus have forgotten that he is the source of life, the fountain of wisdom, and they too have starved themselves of his sustenance by relying on the wisdom of the world, which according to Isaiah leads to rage, and to blaming power sources such as the government, and to blaming God, which leads to even further darkness. But we live in the day in which The Light has come. It’s the call for all of us who know Jesus. We are called to be signs and symbols in the world from the Lord Almighty. Mt. 5:14, You are the light of the world. A city set on a hill cannot be hidden. 1 Pet. 2:9 You are a chosen people, a royal priesthood, a holy nation, God’s special possession, that you may declare the praises of him who called you out of darkness into his wonderful light. Will we respond to the call with a yes? If so, how do we, who know ourselves so well, manage to do this? We don’t. He does. He does it through us as we draw close to Him, as we get to know Him, and as we surrender to Him. The power of our mighty God, our God of Might, works in us. Ph. 2:13 (NLT) For God is working in you, giving you the desire and the power to do what pleases Him. 2 Pet 1:3 His divine power has given us everything we need for a godly life through our knowledge of him who called us by his own glory and goodness. So, returning to Matthew 5:14, that states you are the light of the world- a city set on a hill which cannot be hidden, implying that you, yes, you, are the light of the world. A city… A city is called a city because it is made up of citizens. The “cit” in both words comes from the same Latin root. A city of citizens who belong to a Kingdom of light. Each citizen in a city makes a difference. Each citizen in the Kingdom has a role to play. We are to shine like stars in the midst of the darkness, pointing the way to the wonderful Counselor, the almighty God, the everlasting Father, the Prince of peace. So why does our experience so often not line up with a “shining star” powerful life? I have a couple of thoughts on that. One, I think that we allow ourselves to be influenced by the world. We seek lots of other voices without checking to see if they line up with God’s kingdom. Some of those voices come from churches, and ministry leaders. Please be wary if the message a church or leader is putting out there is fear based, political, or “us versus them”. None of those are the message of Christ. And two, I think we sometimes choose a famine of God’s words. In the book of Amos, the Lord told the people that as a consequence for self absorbed, disobedient living I will send a famine through the land—not a famine of food or a thirst for water, but a famine of hearing the words of the Lord.” (8:11). That prophecy came to fruition in the period between the Old Testament and the New Testament, and the people did not hear the voice of God for 400 years. The Word of God, who is Jesus, the Spirit of God dwelling in us: the power of God operating in our lives, the written word brought to life by the Spirit, it’s all available to us all the time. Do we know how blessed we are to live in this time? The Mighty God, for whom nothing is impossible is here, but He won’t force Himself upon us. He lets us come to Him. Will we be like Isaiah and say, Here I am, send me? Here I am. I’m willing to be a sign and a symbol of Your glory and light to those walking in darkness. Here I am, I belong to You, my life is Yours, You are my heart, my priority, my joy; I will earnestly seek You, and live counter-culturally as a citizen of Your Kingdom. Here I am, God of Might, I am Yours. There is mighty power contained within the Light. In Genesis chapter 1, we read that there was light on the first day. But the sun, moon and stars weren’t created until the fourth day. The Light of Life, the Word that created everything was Himself the incarnation of light the first day. The Hebrew word for “light” on the first day and the word for “lights” on the fourth day, referring to the sun, moon and stars, carry completely different connotations. Light strong enough to give light to the whole earth was poured forth from Him who is The Light. That is a powerful thought-my mind can’t even begin to imagine a picture of a glow that strong. The root word for “government” in this part of Isaiah 9:6 is the Hebrew sarah–which is translated “power”, “to prevail as a prince”. Prevailing, princely power is what is upon the shoulders of Jesus. Not government in the way that we understand it . This is altogether different than earthly governments. And it’s so huge to get this. Not only is Jesus our Prince of Peace-He is also our Prince of Power. We’ll talk about Jesus as Prince of Peace at the conclusion of this series, so I won’t take us too far ahead. But in recent days, I’ve come to embrace the original Hebrew definition of peace, Shalom, as meaning “to destroy the authority of the one making the chaos”. As the Prince of Power, He himself is the power that destroys the chaos. And that power is inextricably connected to His light. The light of Jesus contains all the power to prevail over all things–over every scheme of darkness, over political systems… His Kingdom was ushered in and with it came the light that shines in the darkness, that the darkness cannot overcome (John 1:5). The kingdom of Christ is the most revolutionary politics–perhaps the only true revolutionary politics–the world has ever seen. Unlike all other political agendas, the supreme value of the politics of Jesus is not power, but love. Jesus rejects the politics of power for the politics of love. The power Brian writes of here is the power that we, fallen humanity, aspire to attain. The power of Jesus, though, is the supreme power of love. The inexplicable power of a love that moved the Author of Creation to come to us as a baby in a dirty feed trough. The power of a love that would lead that baby into manhood and ministry and ultimately to the excruciating pain and humiliation of crucifixion on a cross. The power of a love that chose this way of humility, service, grace and forgiveness in order to forever defeat the darkness, forever scatter the chaos, forever establish His Kingdom His way. Prince of power. Prince of peace. Both are the outflowing of the deeper river, which is love. Emmanuel, God With Us, was with Isaiah in this moment. And He invokes the collective “we” here: “We are signs and symbols…” He identified Himself as one with us long before the time came for Him to enter humanity. The Word that was God in the very beginning spoke words that attest to the depths of His love for those He created. In this verse, His words include us, invite us, and recreate us. He spoke then to the coming reality that is now our reality–that He would be seen in us, felt through us, because He has always been God With Us-even before He was with us in the flesh. There are times when my mind and my heart reach capacity and I cannot go further into a thought because the weight of it makes me feel like I might explode. This is one of those times. There aren’t words to encapsulate the wonder, the questions, the awe of my Jesus as I understand Emmanuel in a completely different way. I can’t better communicate what is swirling through my thoughts, because I don’t understand it myself. Fullness of power, light, peace and love can have that effect on a person. To experience Jesus this way is to transcend human comprehension, to defy logic. It can only be fully experienced in the Spirit-our mortal selves can’t bear the weight of all that He is. And all that He is is available to us. Paul says in Ephesians 6:10, “…be strong in the Lord and in his mighty power”. And we can. Because He is Emmanuel. God in us, God for us, God with us. I pray that you experience Messiah, Emmanuel in a way that leaves you breathless with wonder this season. That our Mighty God, our prevailing Prince of power overwhelms your soul and carries you far beyond the realms of your impossible into all that is possible with Him. I don’t know that I can even begin to comprehend what Mary must have experienced during her pregnancy and on her way to Bethlehem. What an honor to be chosen to bear the Messiah. How very difficult to be chosen to bear the Messiah. Thank God for her temporary “city of refuge” when she went to visit Elizabeth who didn’t doubt for a moment that the child within her had been conceived by the Holy Spirit. We can only imagine what she had experienced in her village before and after that visit. And then came the decree that she and Joseph would have to travel…third trimester, on foot, on a donkey, aching back, aching feet, concern for where Jesus would be born, concern about food and water for the journey, where they would sleep on the way, would she make it to Bethlehem before the birth—so many things on her mind. Did she pour out her heart? Did she lament? We know that after the shepherds visited the stable that “Mary treasured up all these things and pondered them in her heart.” (Luke 2:19) Webster’s Dictionary says that the word ponder means “to think or consider especially quietly, soberly, and deeply.” Was the visit of the shepherds as much for her as it was for them? Was this the moment that God showed up after her honest lamenting, the moment that He reminded her of his faithfulness in the past, of His goodness in the present, and of His power in the future? I don’t know, but I think it is possible. Did God choose her because she had an honest and authentic relationship with Him? Did God choose her because He knew she would move through the pain in her lament, or because He knew that she would worship in both the joyful moments and she would worship through crying out in the darkness? Did He choose her because she loved Him deeply and therefore was “real” in her relationship with Him? I know that God desires “real” from us. It’s the only way to have an authentic relationship with anyone, God included. I believe with all I am that we can pour out what is going on inside of us to God BECAUSE He is our refuge. He is our safe place. He is safe. The words “save” and “safe” come from the same Latin word; therefore we can safely pour out our hearts to the safe God who saves. Let’s not be afraid to let it out and find our peace in Him. These are not the words of a heart that is lamenting but, rather, the words of one whose heart had lamented. The words of a woman whose soul found rest in God alone and came out of the refuge of His Presence with unshakable hope and the belief that her salvation and honor depended solely on Him. (Psalm 62:5-7). Mary knew what it meant to trust God. To rely on Him as her place of refuge. She had to. Her situation was impossible, frightening and dangerous outside of the promises God had made to her. She had a choice. Would she trust her God with her life and her future? Would she believe Him over the voices around her that must have been loud and accusing? Would she continue to run to Him alone for refuge? She made a choice to say yes to the God who chose her. And out of the depth of her trust, we see a richness in her faith. I can only imagine the intimacy of relationship Mary shared with her Father… as a result of her willing yes. And, I believe, a willingness to be what she already was: vulnerable and real. Isn’t that what pouring our hearts out authentically before God is?? When we honestly pour out our hearts in the safety of God’s presence, we are not only not denying the dark-we are acknowledging it. We are acknowledging the darkness around us-AND!-the darkness within us! Right? And when we do this-when we honestly acknowledge the dark and pour it out, what are we doing? Aren’t we looking for His light in everything? If we bring all of our stuff to our very safe God who saves us–all of the ugly, all of the dark, all of the time–His light tears through our darkness, through the dark clouds of our soul, and we come away from our pouring out, our lamenting, brilliant. Brilliant because His light always overpowers our darkness. But we have to be willing to bring our darkness to Him before He can overpower it. Brilliant people aren’t the independent, the self-made, the exceedingly intelligent ones. We are brilliant when we take our tarnished souls to the Light. When we let the dark clouds let go of their rain and “pour out [our] hearts like water in the presence of the Lord” (Lamentations 2:19). We can’t drive out our own darkness. We can’t brighten what’s tarnished on our own. Only the Light, the Truth, the unconditional Love we experience as we pour out our hearts can make us shine-can make us brilliant. “Darkness cannot drive out darkness, only light can do that.” We must learn to bring our darkness to The Light. John’s sermon on learning to pour out our hearts, our lament as a form of worship was powerful. We don’t often think of lamenting as worship, and in our western Christianity mindset, we have a tendency to think that in order to be a good Christian, we need to have our act together and be “happy” at all times. However, if we look at the beautiful example of lamenting in scripture, we realize that what God truly desires is for us to bring our true, authentic, messy selves to Him. Only then, can we have a real relationship with Him. Anything else is just pretense. And, in order to bring our true, authentic, messy selves to Him, we have to KNOW that He is our refuge, our safe place (Ps 142:5)…we have to KNOW that “He will respond to the prayer of the destitute; he will not despise their plea.” (Ps 102: 17). We have to trust that He included lament in His word to let us know that He wants to meet us in that place. In my own story, there was a time that I was certain that God did not want my messy self, so I tried to pretend like the darkness, the complaints, the discontent, the pain didn’t exist and did my best to bury it within. Well…darkness cannot drive out darkness, so it stayed within. I became numb to my feelings, I became critical, negative, and I became self-destructive. The darkness was not going to be driven out. As I grew in my relationship with the Lord, and realized that I don’t have to pretend (truly, He knows it all anyway), and I began to bring my pain, my questions, my wrestling to Him–that’s when He began His real work of transformation in my life. What about you? Have you experienced His great love, His brilliance in seasons of lament?